Mid-tour everyone needed rejuvenation. Dambara went off on a hike, Bryan, Rachel, and Atmajyoti are at the beachhouse of a friend, Cancer-me chose to stay home in Hamilton. The trip is jam-packed, but with enough down time to also keep it fun-filled. Air, food, and water are prana-rich, so we continue healthy, and after a few days off, well-rested. Tomorrow everyone returns to Hamilton and Friday we go to Auckland for the weekend. That venue is also a retreat facility. Fortunate, since we have no friends there (yet) to host us. We planned a series of classes then added sadhanas to turn it into a retreat. That’s the future; here’s the past. 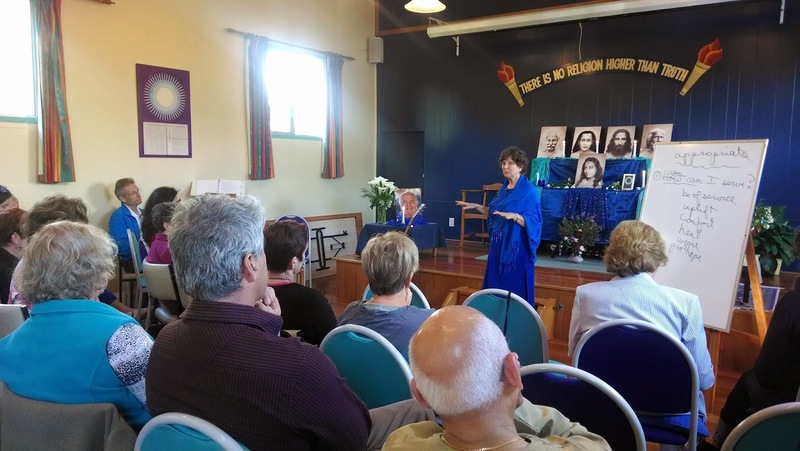 Wellington started with a program at the Theosophical Society. The Theosophists have not been on my radar until we got here. The movement started in the late 1800’s and was a groundbreaker for world brotherhood and spiritual adventurousness, promoting unity of race and religion, the idea of Mahatmas guiding the planet toward evolution of consciousness, and metaphysical thinking in general. It has no creed of its own, but fosters honest exploration of all paths. It continues to be a force in New Zealand. In both Wellington and Palmerston North we have been hosted/aided by the society. The Wellington Theosophical Society has a marvelous old building, narrow, high ceiling room, wood trim and floors, and an extensive lending library of spiritual and occult books. Some join just for the library, which now includes a selection of Swamiji and Master donated by us. About 40 people came, half Theosophists, half there for the first time. A decades-long tradition of spiritual inquiry gave the room a unique flavor. The subject -- The Yugas -- was ideal for the place and the audience. 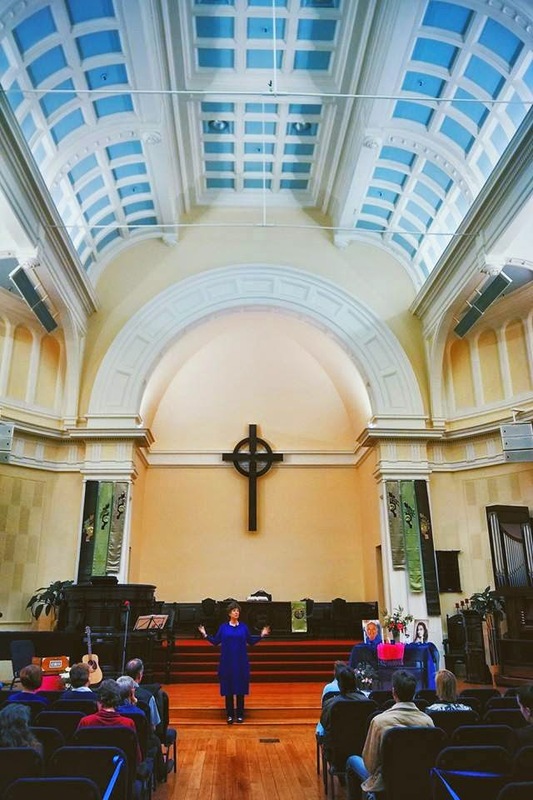 For the weekend, we moved to St. Andrews Church, another fabulous old building in downtown Wellington. Friday was in the sanctuary; Saturday classes in a smaller, modern room in the annex. The sanctuary included one of those elevated platforms with a waist-high railing where the minister can stand to deliver his message. I enjoyed the God’s eye view it gave, but for the program opted for ground level. I’m glad to have moved on from those church-going days, but the real estate is gorgeous, and the atmosphere profound. St. Andrews was a marvelous venue, and I’m happy to have spent an evening there, but it was spacious for the 20 people who came. Choosing the right size venue is the hardest part of tour planning -- the delicate balance between optimism and realism. We’ve done well enough for our maiden voyage. It was June 2012, when Swamiji asked me to become a “global ambassador.” Profound moments often happen in mundane settings. We were walking into the Stanford Shopping center when -- between the teashop and the luggage store -- my life was redirected. “Personal contact is also important,” he replied. Information, vibration, even consciousness comes across the internet. I watch Swamiji’s videos almost daily. Something happens in person, though, that can’t happen any other way. Especially a first contact. I felt that in India, but even more here. Perhaps because in New Zealand Master is little-known and people are attracted as much by example as precept. Ananda people are unique. Another reason for personal contact: more relationships are possible than just with the featured creature -- oops, featured speaker. During the breaks in the classes, everyone is fully engaged. None of us can imagine doing this tour with anyone but this team. But, in fact, we could substitute dozens of times, probably a hundred times, and each team would be an equal expression of harmony, attunement, talent, individuality/eccentricity, and joy. All of Krishna’s soldiers look like Krishna. And all Master’s children raised by Swamiji express the same spirit. The Wellington classes were delightful. Small attendance, not more than 10, but each person was interested, intelligent, open, and fully engaged. It was effortless to talk to them -- first about intuition, then about death and dying -- because of the magnetism in the room. Earlier in the week we played tourist in Wellington, strolling by the harbor, taking the funicular to a botanical garden, walking down the hill through acres of plants, trees, and flowers to lunch by the rose garden. Wellington can be cold and windy, but for us it was warm and sunny. The city is a pleasant blend of energy and relaxation. That seems to be the characteristic of this country. It reminds us of Switzerland, in the way everything is clean and neat, even in the less prosperous areas. And in wealthy neighborhoods, things are simpler than in the U.S. Houses less elaborately designed and decorated. Certainly there is materialism, but not as avid as we are used to. Every meditation, no matter how new the group, has been exceptionally still. Swamiji said that many New Zealanders are naturally attuned to subtle realms, a legacy in the land from the Maoris. Perhaps that is part of what we are feeling. 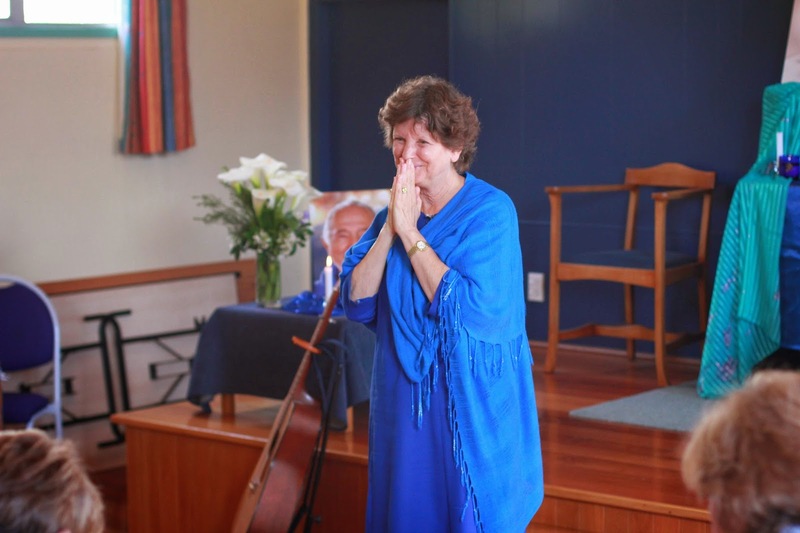 Visiting a new friend in a quiet neighborhood today it occurred to me, “New Zealand is a good place for sadhana.” Expanding Light New Zealand could be a popular destination. Plus a community to run it. Energy and relaxation. Perfect. For our classes, we have not set up the full altar, displaying only Swamiji and Master, to give context to what we present. The altar comes out for Sunday service and teaching meditation afterward, and for the Kriya we did. Even though we were offering the usual classes in Palmerston North, we felt more devotion was appropriate. Classes were held at the Theosophical Society hall -- another marvelous old wooden structure, newly refurbished but still holding decades of truth-seeking vibes. 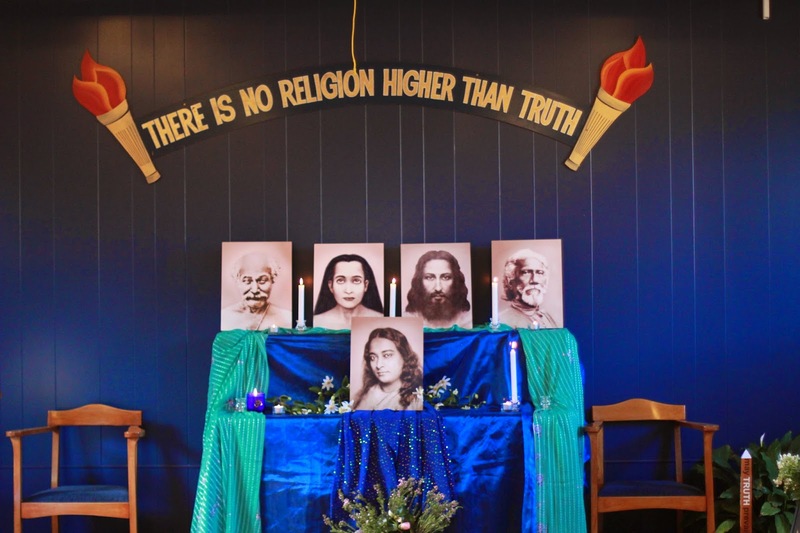 Right under their motto -- “The only religion is Truth” -- we set up the whole altar. Dambara always sings a few songs at the beginning, middle, and end of each program, but here we divided each session almost in half, starting with a long period of songs, chanting, and meditation. After a brief intermission, class started. It wouldn’t have worked in Wellington, but in Palmerston North it was perfect. We also showed Finding Happiness, to rave reviews as always. He wasn’t satisfied, but I couldn’t think of more to say, nor did I feel like arguing the point. Later I thought of the right response. Yes, everything worldly has two sides. Waves on the ocean -- for every crest there is a corresponding trough. There is no opposite, however, to the spiritual path. Every effort to realize God brings you closer to God. It is the end of duality. To present life at Ananda in terms of the “pros and cons” is to miss the point. The purpose of Finding Happiness is not to persuade, but to inspire. In this it succeeds beautifully. His suggestions were well-meant even if they missed the point. The movie did touch his heart, and he wanted to make a good thing better. I had an interesting discussion with a devotee about another path where obedience to that guru is the fundamental practice. Even when the disciples don’t understand what the guru is asking, or why, still they must obey. They can question up to a certain point, then they must surrender to his will. Perhaps this benefits those disciples. It is not my place to judge. All I can say is: Thank you, Master, for sending us Swamiji. Swamiji taught us to build our faith on the bedrock of our own experience. Happiness expands when it is shared. From this everyday example we can extrapolate all the way to Satchidananda. Thank you, Master, for sending us Swamiji! Swamiji often said he preferred an honest argument to a mindless yes. Cooperative obedience is the right practice for this age. Respect for wisdom with full engagement of intelligence and will. If you start with a dogma that can’t be questioned, you can only think to a certain extent. If reason doesn’t support dogma, reason has to be sacrificed so dogma can survive. The relationship between Ananda and SRF hasn’t been part of any public discussion, but privately it is an ongoing issue. Our hosts are former SRF members. They are clear in their decision, but some of their gurubhais have expressed grave concern about their involvement with Ananda. I would love to put this whole issue behind us, but I think we have a ways to go. “Go with your heart,” Atmajyoti replied. P.S. The ongoing photo album for the New Zealand tour can be found here.